Summary: This article is going to show you the best Android Device Manager for your reference. You can read this page to learn the features and how to perform it in details. Due to the high price of iPhone and the favorable price of Android ones, Android phone and tablets account for lots of market share all over the world as time passed by. And an increasing number of people tend to use Android smart phone such as Samsung, LG, and HTC, etc. But no matter what brand cell phone you are using, it will always come to a situation that the storage of the phone is not enough. Many aspects can lead to this, such as the swarm of the contacts, text messages, videos, and music. This may probably drive you crazy when you want to add some new contacts or videos. So what can be done to improve this situation? It's quite easy. We are going to introduce a full-featured Android device manager called MobiKin Android Device Manager (with its Mac version) to be your assistant. 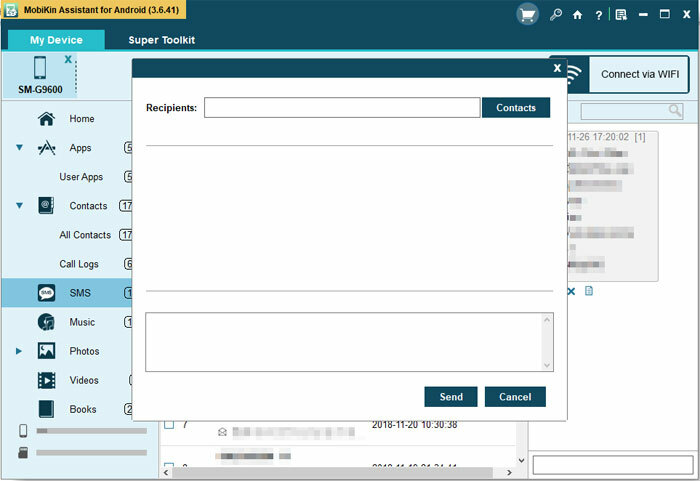 With the help of the software, you are able to transfer content from Android phone to computer, and vice versa, edit and manage phone data on computer directly. It is compatible with almost all Android phones and tablets. By the way, here are two versions of this Android manager program. You can choose one of them to download according to your computer. At first, you need to use a USB cable to connect your Android phone to computer and then launch the installed program on PC. Here, you should remember to open the USB debugging on your device or it won't be able to be detected by the tool. 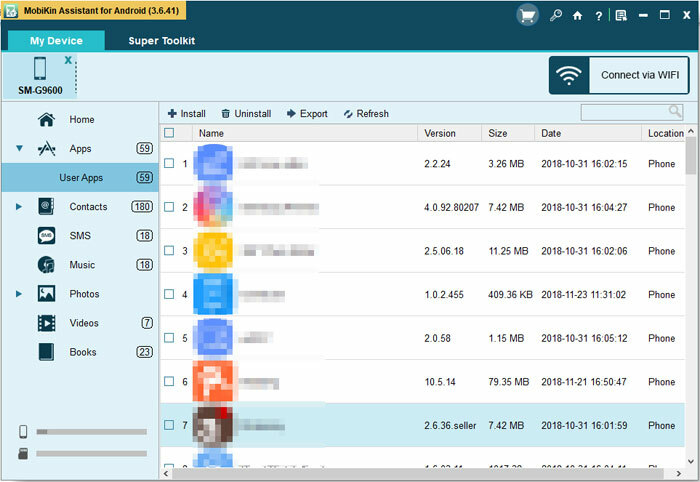 Next, on the main interface of the software, you need to tap on the “Super Toolkit” option at the top and you will see the options Backup and Restore. 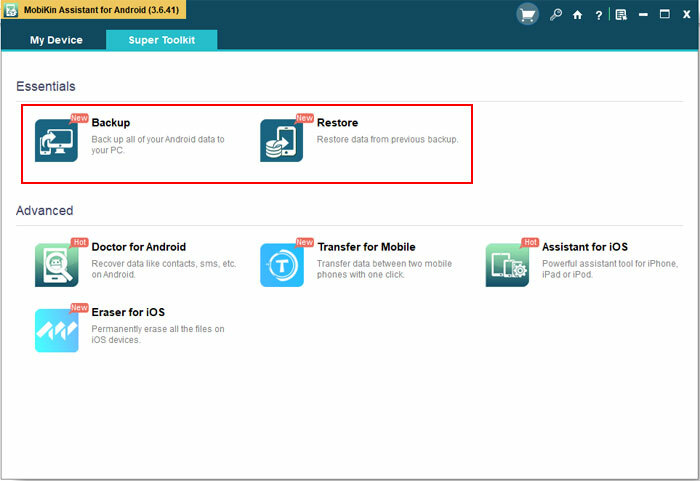 To backup your Android data within one click, you have to tap on the Backup option on the screen and a pop-up window with several options like Apps, Contacts, Messages, Music, etc. will appear. You can tick the folder that you want to backup and select a location to save the files. At last, you can tap on the “Back Up” button to start the moving process. 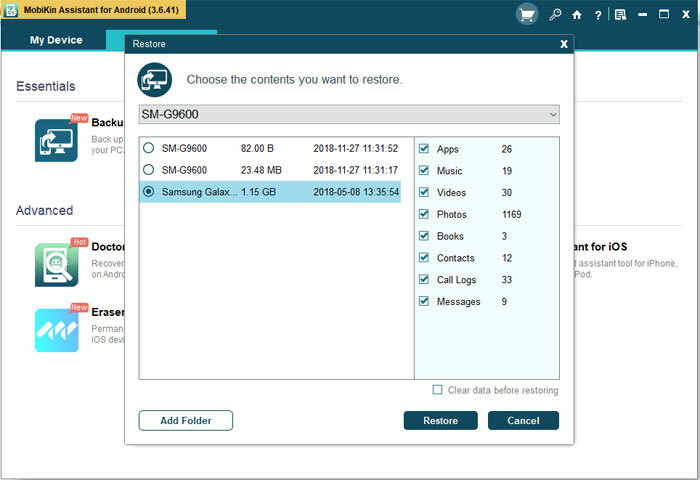 To restore the backed up data with this software, you can also simply tap on the option "Super Toolkit"> "Restore" and select the files you want to recover and hit "Restore" button to get them back. - Install the Android device manager software on your computer. Then, link your Android device to the computer via a USB cable. Enable USB debugging on your phone to make it be recognized by the program. After that, you will also see the following screenshot. Note: If your Android device is failed to be recognized, you need to find a solution for it firstly. Transfer to computer: All the transferable and manageable file types are listed on the left penal. Just select the file types you want to transfer to computer and click the "Export" button from the top menu. Transfer to phones: Click the button of "Import", "Add" or "New" button from the top menu to transfer files from computer to your Android phones or tablets. You can click "Contacts" first on the left column. 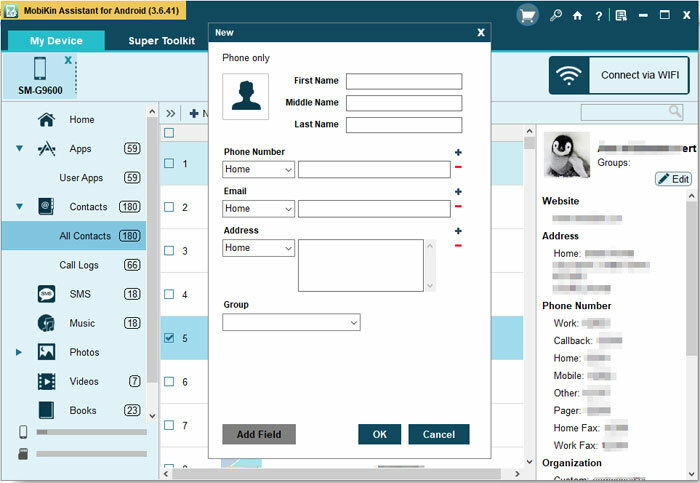 All contacts will be scanned out and you will see several managing options displayed on the top menu. Now you can manage these details as you want. 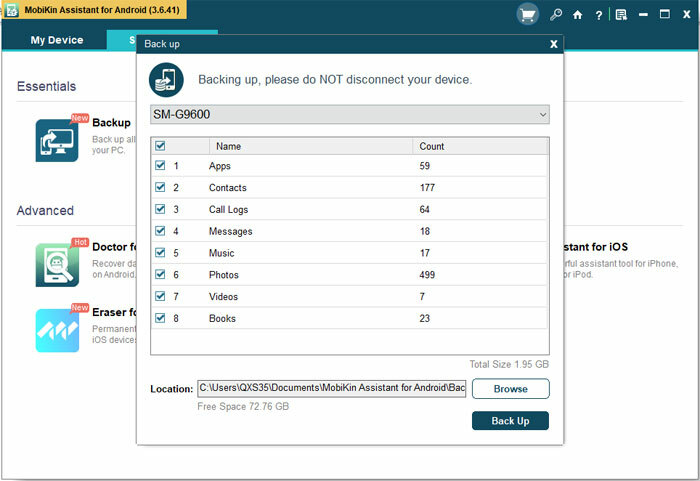 Import - Load the contact backup file from computer to Android devices. Import - Load the backed up messages to Android device. Export - Copy the selected media files from Android to computer for backup or other uses as you like. Tap on the "Application" folder in the left panel and then all the applications on your device will be displayed in the right pane. After that, you are capable of install, uninstall or export the Apps on your phone without any limitation. Export- Move some applications from your phone to computer to make a backup. 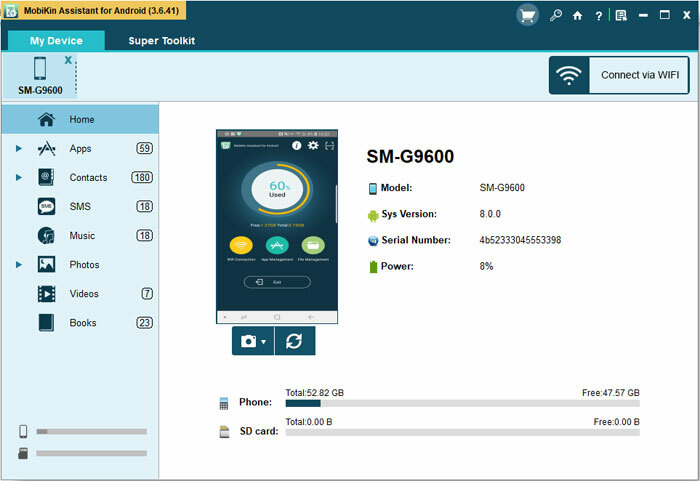 Now, you have a simple understanding about this Android device manager and it's your time to free download the program to have a try!